While it would be ideal for water to come up out of the ground pure and unadulterated, the simple truth of the matter is that it doesn’t. When water is pulled up from the ground, it’s filled with a variety of different contaminants which serve to negatively affect its overall quality. The contaminants which inundate a water supply can cause a number of different problems to arise, including poor smells, poor tastes, staining, and more. Are you having issues with your water in Kildeer, Illinois? Wondering how to deal with these issues? If so, you’re in the right place. Here is a list of 4 common water issues and their solutions. Does your home suffer from inconsistent water pressure? If so, the problem could very well lie in your water pipes. Generally, the longer that pipes exist, the more clogged they become, adversely affecting the flow of water which passes through them. The reason that pipes become clogged is that they become inundated with calcium and magnesium. As time passes, these hard water minerals build up on the insides of pipes, restricting the area through which water can flow. Want to prevent such buildup from occurring in the first place? The solution is to install a water softener. Is your toilet bowl stained orange? Are your shower walls constantly covered in strange colors? Does your clothing possess a slight shade of brown? If so, it’s likely due to the state of your water. Different minerals which exist in a water supply are capable of staining objects with which they come into contact. Each different type of mineral will produce a slightly different colored stain. Depending on the types of stains you’re dealing with, there will be a specific type of water conditioning system that can do away with these stains. For information on specific solutions, speak with us! Often times — particularly when you get your water from a well — you may notice that it carries with it a bit of a bad odor. Generally, this odor is described as smelling like rotten eggs. The reason for a rotten egg odor in your water? In most cases, it’s the existence of hydrogen sulfide. However, in rarer cases, manganese can be the culprit. Generally, in order to ‘fix’ foul-smelling water, you will need either a hydrogen peroxide injection system or a chlorine injection system. A water conditioning specialist will be able to help you determine which situation is best for you. Hard water comes with a variety of different tastes, many of which are not at all appetizing. Does your water taste bitter? If so, hard water is likely the culprit. To eliminate its bitter taste, you will have to remove the calcium and magnesium from your water with a water softener. Does your water have a metallic taste? If so, iron is likely the problem. Fortunately, you can easily remove iron from your water with the use of an iron filtration system. Regardless of what your water issue is, it is wise to utilize a water conditioning system in order to do away with it. Looking for a water conditioning company in Kildeer? If so, Johnson Water Conditioning is the company to call. 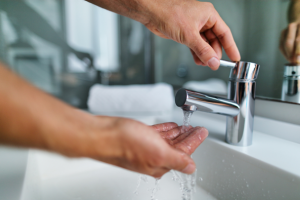 We offer a wide variety of water conditioning systems, from water softeners, to chemical injection systems, to reverse osmosis systems, and more. Not only will we supply them to you, we can install them for you as well. Contact us today to discuss your issue!